This post will guide you how to use Excel MID function with syntax and examples in Microsoft excel. The Excel MID function returns a substring from a text string at the position that you specify. The MID function is a build-in function in Microsoft Excel and it is categorized as a Text Function. The MID function is available in Excel 2016, Excel 2013, Excel 2010, Excel 2007, Excel 2003, Excel XP, Excel 2000, Excel 2011 for Mac. text -This is a required argument. The text string that you want to extract substring from. start_num-This is a required argument. The position of the first character that you want to extract in text string. num_chars-This is a required argument. The number of the characters that you want to extract from a text string. If start_num is greater than the length of text, the MID function will return empty text. If start_num is less than 1, the MID function will return the #VALUE! Error value. If num_chars is negative, MID will return the #VALUE! Error value. The below examples will show you how to use Excel MID Text function to extract a substring from a text string. 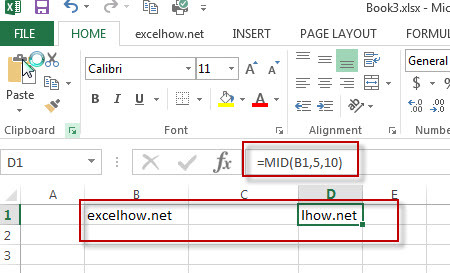 you need to extract the multiple lines into the separated rows or columns, you can use a combination with the TRIM function, the MID function, the SUBSTITUTE function, the REPT function, the LEN function to create a complex excel formula…. If you want to extract only attribute values from xml data, you can use a combination of the MID function and the LEN function to create a new excel formula…. If you want to get the position of the last occurrence of a character in a cell, then you can use a combination of the LOOKUP function, the MID function, the ROW function, the INDIRECT function and the LEN function to create an excel formula. ….